Shaquille O’Neal’s stellar nineteen year career spanned six NBA teams. O’Neal began his career in 1992 as a member of the Orlando Magic. After four successful seasons, Shaq was traded to the Los Angeles Lakers. He spent eight elite seasons with the Lakers winning three NBA championships from 2000-2002 before being traded to the Miami Heat in 2004. Shaq spent three plus seasons with the Heat enabling them to win their first NBA Championship in 2006. “Shaq Attack” is a dunking timeline of Shaq career with each franchise he played for. 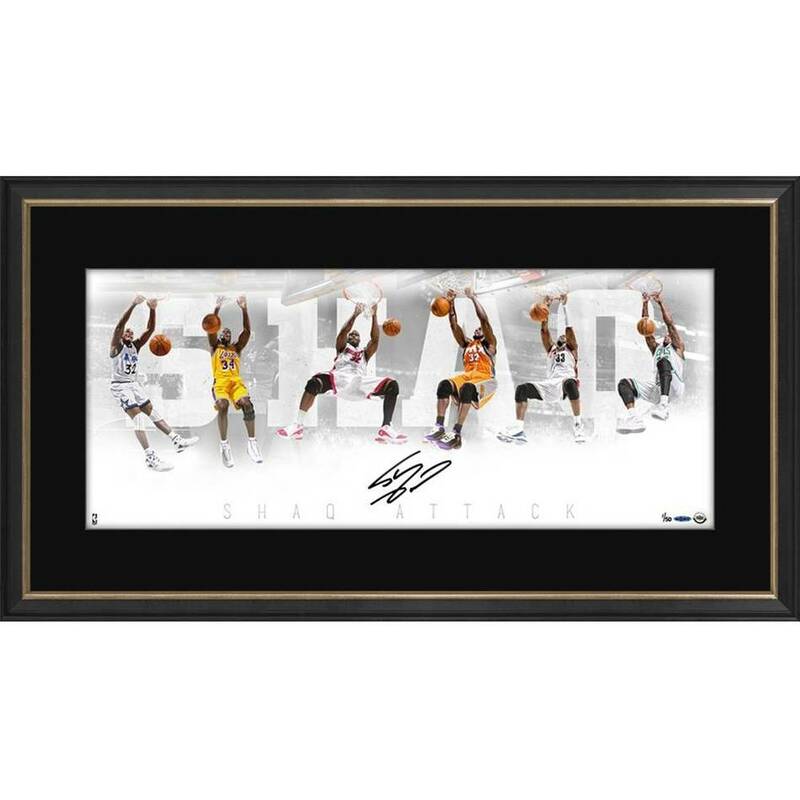 Shaq has signed this limited edition 36” x 15” print in black paint pen. His signature is guaranteed authentic by virtue of UDA’s Five-Step Authentication Process. Upper Deck Authenticated®Autograph forgeries make victims out of unsuspecting fans. In 1992, Upper Deck Authenticated® became the first company to find an answer to the forgery problem by creating an airtight five-step authentication process that assures fans are getting genuine autographs. Today the company has autograph relationships with many of the game's biggest stars and produces some of the finest sports memorabilia in the North American market, and Official Memorabilia is proud to extend access to Australia’s astute and discerning memorabilia community.